As things have started getting back to normal after the holiday season, BioWare has been posting a few updates in the forums. We will take a look at some of the items that have been discussed. Speaking of things being posted, it appears the Public Testing server is up. There are a few items that are being tested currently. It’s time to get into all the links. The testing of 3.1 is underway on the PTS. Yesterday, January 8th, 2015, the latest patch notes were posted for the Public Testing server. As of now, it appears the Jedi Knight Guardian/Sith Warrior class is getting some possible changes, specifically the tanking spec. Of course that is not all that is being tested, but currently that appears to be the specific patch notes that have been posted. As of RIGHT NOW, Game Update 3.1 is available on the Public Test Server. The dev team will be around in the PTS Forum to gather feedback and answer questions, so let us know what you think! As with all PTS content, this content is incomplete and subject to (and will) change. We will be adding new content while 3.1 is on PTS, so stay tuned for more updates. As a side note, the PTS forum now has its own “Bug Report” subforum, so let us know of any bugs that you find in your adventures! I would suggest as many as possible take some time and download the latest update to the PTS. This is your chance to see what Update 3.1 is all about and help catch some of those pesky bugs before it goes live. As you go through PTS, you may notice a lot of bug fixes/changes that are not reflected in the 3.1 PTS Notes. The reason for this is that a lot of those are not actually from 3.1 – they’re from 3.0.2, which is included in this build. So if you’re wondering why we didn’t mention something (such as “[WEEKLY] Spirit of Cooperation” rewarding a full set of 192 Companion gear), it’s because it is likely from 3.0.2 and you will be seeing it live much sooner than 3.1! Above is another post from Tait about Update 3.1 on the PTS. Also a hint at a weekly quest rewarding a full set of 192 companion gear!!?? Hmm is Tait trolling us? I would like to see them add more gear of this level for companions only. That means less comms being used to gear companions. It also means less fighting over gear drops for companions. This is a good idea BioWare. When we started the Life Day event, we got questioned on two things almost immediately. Where is the Gree event and why is the Cyan Sphere on this vendor without it? Two valid questions. As I mentioned before the end of the year, it is our intent that the next time you see the Gree event it will be scaled to level 60. I am here to deliver news on both of these fronts! First, it is our plan right now that the Gree event will return end of February/March timeframe. We are still working out the exact timing but we will update that information on our events page when we have it. Second, I know there was concern around the Cyan Sphere and its cost. We are going to be moving the Cyan Sphere vehicle onto the Gree event vendor with 3.1. Also, just to make sure the vehicle can be attained by both the Gree and Life Day participants, you will find two separate ways to buy the vehicle. You can either buy it with a mix of Snow-covered Parcels and Grey Helix, or just Grey Helix alone. This way regardless of which event you tended to participate in, it is still accessible to you! Again, we will update more specific timing when we have it and you will now find the Cyan Sphere on the Gree vendor with 3.1. Thanks for the update Eric. 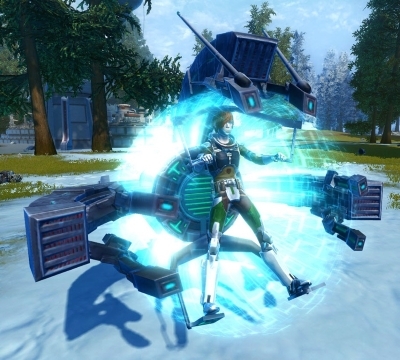 It is great hearing the Gree event will be coming back the end of February. I also like the idea of allowing players to use a combination of Grey Helix and Snow-covered Parcels to purchase the Cyan Sphere mount. Now it will make more sense having this mount on both the Gree and Life Day vendors. Do you think more events should be linked together? Should more in-game currencies work together like the Grey Helix and Snow-covered Parcels? I am going to post a SUPER SECRET PRE-PATCH NOTE from 3.0.2 just for you, but you have to promise not to tell anyone. • The Healing Challenge during the Dread Master Raptus encounter in Nightmare Mode Dread Palace is now able to be completed. Your secret is safe with us. We won’t tell a soul about the super-secret early patch notes. However, if there were a note about the Healing challenge in Nightmare Mode of Dread Palace being fixed, I’m sure many would be over-joyed. Thanks for the secret Tait; the secret is safe with us. Would you like to write an article, create a video guide or maybe you have another idea altogether? All you need to do is send us an email with your idea and a small writing sample to explain your skills and why you want to help out at Corellian Run Radio. Submit your ideas, a bit about yourself and a small writing sample to us at corellianrun@gmail.com. We are back to the music videos. This week we have posted by SWTOR forum user, Nerumi. The song is called “Bad Boy,” by Cascada. In the video we have a female singer singing from what appears to be the Coruscant Stronghold. The singer parts of the video utilize a great rang of emotes and dances to give the performance of the avatar singing this particular song. The “story” part of the video is that of several cutscenes from the Sith Warrior storyline. From the choices being showcased this specific Sith warrior is a “Bad Boy.” This is a fun video and was nicely put together. Take a moment and let the creator know what you thought of the video in the comment section below. If you have created a video about your adventures in SWTOR let us know by emailing a link to corellianrun@gmail.com or jason@corellianrun.com. We would love to share it on our website! Please let us know if you have a particular link, story, video, or topic related to SWTOR we would love to hear about it! You can send those to us here at Corellian Run Radio and we can place it in a future article. Just email us the links and/or the details for the event at corellianrun@gmail.com, or you can also leave any link suggestions in the comments below, or in Corellian Run Radio’s Facebook group. See you next week!